« New RobotGeek I/O Boards are Here! 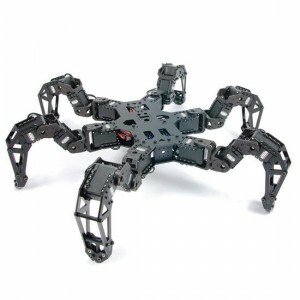 Check out the PhantomX Hexapod/Quadruped Mark-II! Our outrageously popular PhantomX Hexapod and PhantomX Quadruped have gotten a make-over! We’ve re-designed the crawlers in matte black Plexiglas, as well as updated the leg design for a larger range of movements. Check out our sneak peak videos below to see them in action. These two crawlers are still powered by ROBOTIS’s DYNAMIXEL AX servos, giving them great speed, torque, and control. And just like the previous version, the new crawlers are controlled with our own ArbotiX Robocontroller, making them compatible with the Arduino environment. The PhantomX Hexapod and Quadruped are two great ways to get into robotics. Whether you need a research grade robotic platform, or or robot to to build on for mech warfare, pick up one of our crawlers today. This entry was posted on Wednesday, February 13th, 2013 at 12:09 pm	and is filed under Announcements, Front Page News, Misc, New Kits / Products. You can follow any responses to this entry through the RSS 2.0 feed. You can leave a response, or trackback from your own site.